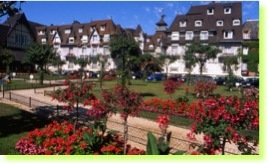 Deauville, lady of the French coast, its most glamorous seaside resort, symbolizes elegance, prestige and sophistication. This is also the city of the horse, with its famous races and a gateway to the “Pays d’Auge” (a world of manors, stud farms and half-timbered houses… With its apple trees in blossom and famous local cheese). 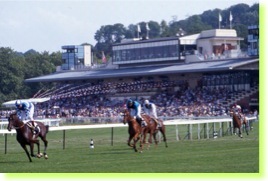 Deauville is also well known for its Casino, and its Festival of the American Film. The jewel village of Honfleur, as both a sea and river port, which has preserved its rich artistic and historic heritage, is located only 15 KM from Deauville. On your own, by train : Direct trains are available every day from Paris-St. Lazare station (20 mn by taxi from the hotel Raphael). The duration of the trip by train is 2 hours per way. Direct trains are also available for the return trip. The average price for a round trip First Class train ticket is 100 €. 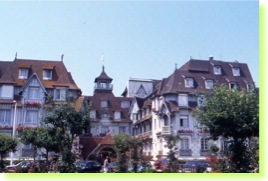 Taxis are available at the Deauville train station. 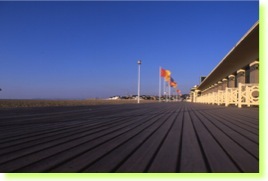 Your concierge in Paris can also help you to book a taxi at your disposal in Deauville. Several car rental agencies are also available (Hertz, Avis, Sixt). On your own, by car : Take the Motorway A13 and A132 from Paris, “Porte d’Auteuil”. Exit D677 “Canapville”. The duration of the trip is roughly 2 h 15. Rental car agencies are available near the hotel (Hertz, Avis). Drivers are professionals, selected for their enthusiasm, personality, spoken languages and driving skills. 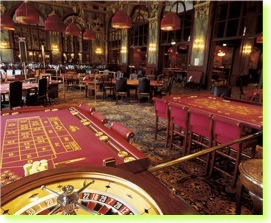 They are intensively trained in advanced touristic knowledge. Le Spinnaker - Refined cuisine from the sea and traditionnal food. Modern style decoration. Average price 50/100 €. Le Ciro’s - gourmet restaurant on the Deauville boardwalks; early 1900s style decoration. Average price 50/100 €. Les Vapeurs (Trouville) - Traditionnal casual brasserie. sea food and traditionnal food. Average price 50/80 €. The Villa Palatine, built around 1870, is a listed building classed as a “Villa Remarquable” (a remarkably beautiful building). 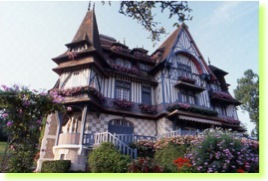 The villa is an excellent example of the “Folies” architecture so much favoured at the end of the 19th century. "We have renovated it with great care and respect of its original style to be a haven of peace for our guests." 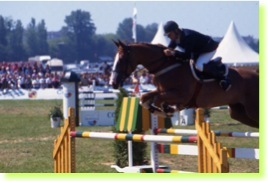 Gérard and Dominique are members of the Clefs d’Or Association (International Golden Keys Association). 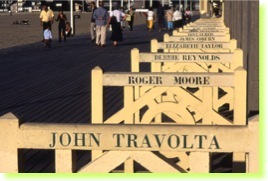 Both have an exceptionnal knowledge of Deauville and the Normandy region. They will be delighted to welcome you.